This addon provides additional functionality to display attendee information. The attendee information must of course be available in the ics file or in your events inside wp. The add-on displays participation status (with icons) and attendee roles (cs roles). It will attempt to cope with any missing names and missing emails to present a reasonable list. Css classes are provided to allow you to style the information. The formatting functions are pluggable should you wish to override them if css options are not adequate. A possible use. 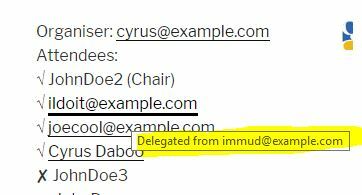 Note that the base plugin allows you to choose where the organiser, attendee counts and attendees should be displayed.